I fought it, I really did. I thought Twitter was dumb and pointless. Then I got this fancy new phone and now my tune has changed. I started following a few baseball writers and now I’m hooked. So I decided to create my own profile and give it a whirl. You can follow me at needmomorneau. I really have no idea if anything I post will be worth reading (but very few things on the web are worth reading anymore), but we’ll see. Really?!? You’re freaking Felipe Lopez!!! Sometimes baseball players amaze me. This is a picture of Felipe Lopez last night after hitting a home run in the top of the 11th inning off of Brian Schlitter of the Cubs. The home run ended up winning the game for the Cardinals so I’m not arguing that it wasn’t a big hit. But this display from Lopez was certainly over the top. First off….he’s Felipe Lopez. The same Felipe Lopez that is currently on his 6th team in 10 ML seasons. The same Felipe Lopez that currently sports a lifetime .269 batting average. Secondly….you just don’t go into that kind of theatrics after hitting any home run, I don’t care who you are. On top of that, it’s not like he hit the ball off of Mariano Rivera. He hit it off Brian Schlitter who was making his 4th ML appearance (and his 1st since being activated from the DL). 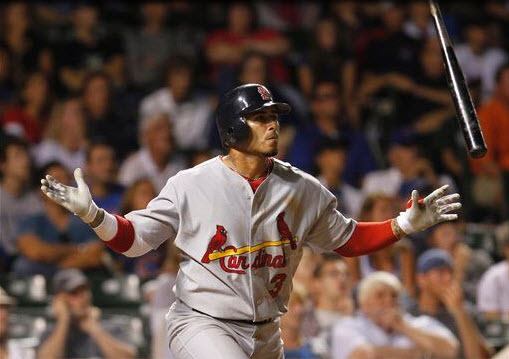 While I am sure Lopez just got caught up in the moment and truly isn’t a bad guy, I’m sure he realizes that he is due a fastball between the numbers on his back the next time the Cubs and Cardinals face off. When I was younger, I very much looked forward to the annual Home Run Derby that was conducted on the night before the All-Star Game. Back then it was fun to watch but now…. ugh! For the most part, the actual competition was ok. Corey Hart had a great 1st Round, Hanley Ramirez was very impressive, and David Ortiz closed the night with a great Championship Round performance. But the broadcast was horrendous. Let’s break down the 3 antagonists. 1. 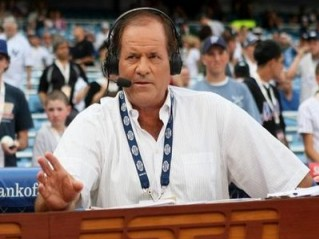 Chris Berman – Ok, I know the guy is one of ESPN’s originals but I think it is high time that the powers that be at the “Boo Yeah Network” put Berman out to pasture. Every year, this show is the exact same thing. I honestly feel that I could make an audio recording of any given year and insert a local suburb into his “That ball is all the way to (insert city here)” line and I would get the same experience. And did anyone else get the feeling that he made out a list of the towns he was going to use and was just waiting anxiously to use one? He sure sounded happy yelling “That one is heading to San Juan Capistrano” on a ball that landed in the bullpen. 2. Joe Morgan – Really, I don’t know if much can be said for Mr. Morgan. ESPN should have taken him off the air a long time ago, yet he continues to be part of all their big broadcasts. I’ve never heard an announcer that is quite the combination of ridiculously biased, wrong about most things, and switches his allegiances as much as Morgan. 3. Bobby Valentine – Who is the genius at ESPN that thought putting Bobby V on the air was a good idea? Every time I see him on TV he seems uncomfortable. Last night when he called David Ortiz by “Jose”, I thought I was going to fall off the step ladder I was on. Note to ESPN (and any other network) – just because someone worked in baseball or played baseball, they aren’t necessarily TV material. Each “team” goes through just one time. The current Derby takes WAYYYY too long with the multiple rounds. While my format comes out to roughly the same amount of “out swings”, I think the pace would be much quicker. I also think the fans would be more into it since it would be teams competing instead of just individual players….so you’d get the Red Sox versus the Marlins in the final. Just a thought. I had a whole other post ready to go but this was a news story that was too big to ignore. George Steinbrenner passed away today at the age of 80 after a massive heart attack. Whether you liked the guy personally or not and whether you agreed with his tactics and methods, you had to admire the guy’s desire to be the best. When he bought the Yankees, they were a shell of their past glory and over the years he transofrmed them into a corporate giant that went beyond a sports team. I’m a big believer in making time for yourself no matter how busy you are. I’m also a big believer in traditions. And to top it off, I’ll be turning 35 and the end of this year and I think it’s time to put all these things together and I think I’ve come up with a good solution. So in the grand tradition of the Jay Buckley Baseball Tours, a buddy of mine, my brother, and I have decided to start our own annual baseball odyssey. With our inaugural trip this year we will be setting out from Central Illinois and traveling north to catch a game in Milwaukee and two games in Minneapolis at the new Target Field. Most of you know I’m a big Twins fan and this will be my very first trip up to Minnesota to catch a Twins home game so I’m very excited. What I’m not excited about is the ticket prices that I’m finding. My original plan was to pay big for one game and sit close and then pay small on the second game and sit somewhere relatively “scenic”. What I’m finding is that the secondary market on tickets up there is pretty high. I can’t even find “cheap” tickets that are by definition….CHEAP! I have time though so I’ll keep looking. I was easily able to snag great seats in Milwaukee so I was happy there. I’m semi-tempted to see if the guys are up for the Sunday August 15th afternoon game between the Sox and Detroit in Chicago but that may be asking for a lot….4 games in 4 days. We’ll see. Earlier this year there was a quiet little product that was released with little fanfare but quickly caught fire. That product was called Famous Fabrics by a little known company called Creative Cardboard Concepts. Pre-sells on the single boxes were around $70 and by the second week after the release, boxes were fetching $140 or more. While the cards themselves didn’t have any player pictures or team logos (due to licensing issues), the cards featured huge jersey swatches, great patches, and unique player combinations that we haven’t seen. So after the huge success, was it any surprise to hear that there was going to be a second product? So in the great tradition of the Hollywood blockbuster sequel, we have Famous Fabrics: Second Edition releasing on August 4th. Pre-sell prices on the product are currently hovering around $85 (Dave and Adam’s) as retailers seemed to have learned their lesson from the previous release and aren’t pricing the product too low this time. Each box contains just one card, which is encased so there are no issues with the cards being damaged between the factory and your hands. Every game used memorabilia card is numbered to only 9 with a ton of cards being 1/1. In addition, there are cut signature cards of legends like Babe Ruth, Mickey Mantle, Joe DiMaggio, Lou Gehrig, and many more. The whole product run is limited to just 5,000 boxes and only 500 10-box cases. Two words…Stephen Strasburg. Like it or not, Strasburg has taken over the hobby like no one has in years and any product that offers a chance at something with him in it is going to sell big. And when you are the first product to offer a jumbo patch for Strasburg, people are going to be all over it. 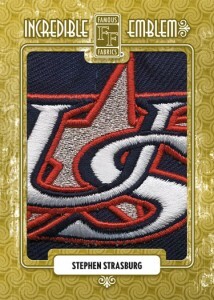 Yes, this patch is not a Washington Nationals patch, but look at it! That patch could be from Nick Punto and I would still think it was a freaking cool patch. Maybe USA Baseball memorabilia pieces aren’t your thing. 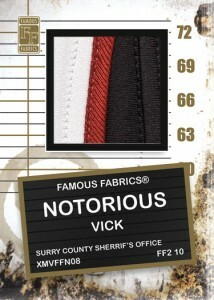 That’s ok, Famous Fabrics has you covered there if you’re a Strasburg chaser. Check out this autograph card. Yes, that is part of an autographed hat from Stephen Strasburg. Someone can correct me if I’m wrong, but I can’t think of any other product that I’ve ever seen where they diced up a signed hat bill and placed it in a card. I imagine this card is very thick (thank goodness they all come to you encased). 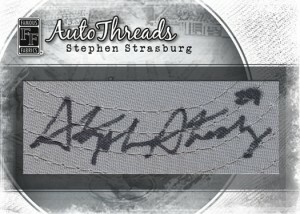 In addition to this unique Strasburg hat auto, they have a Tiger Woods golf glove autograph card that is in the product. 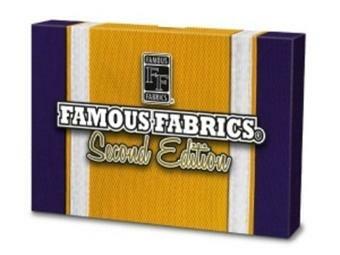 So is Famous Fabrics: Second Edition going to be a winner? Yes, I think it certainly will be. 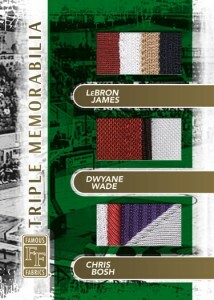 If you’re like me and you love love getting big game used patches, this product is definitely for you. If you’re in the hobby for the thrill of the big gamble, I also think this product is right for you. There are tons of cards in the product that will far exceed the current $85 pre-sell price. Remember, there are only 5,000 boxes being produced so as boxes/cases are being bought and busted, if the big prize cards are not being hit early the prices on the still sealed boxes are going to go up and up. So if you’re getting in on this, get in early. For this card here, I have to give a lot of credit to the folks at Creative Cardboard Concepts. Whether you like all the Lebron/Wade/Bosh hoopla or not, you have to give credit here for being reactionary to the current sports news. Being a small company CCC has a much easier time reacting to what is hot in the sports world and making adjustments. I would venture to guess that at this time last week this card wasn’t going to exist in the card set. But now it does and will certainly be a hot card. Kudos to CCC.